Today marks the 300th challenge with The Cat''s Pajamas and we have a special challenge for you! To celebrate, the challenge is to Case The Cat. The DT has picked one of their favorite cards and you are to CASE one. This card was made using the set Space Cadet and I had it look as though the rocket was leaving earth. For the stars, I used both a glitter gel pen and some sequins. There are many fabulous cards to choose from that each DT pulled out and we hope that you will play along! Who knows? 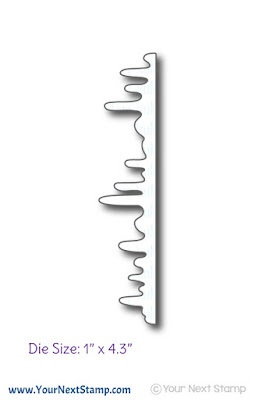 You just may win a gift certificate to the TCP Store! Thanks for stopping by and have a great Tuesday! If you haven't already linked up or are playing along, the Fall Coffee Lovers Blog Hop is happening right now and Your Next Stamp happens to be one of the fabulous sponsors for this event! I made a CAS card using one of YNS newest release set of Perk Up. I thought the image I chose is perfect for my hubby and mine upcoming anniversary. The mugs were colored in the colors of some of our favorite mugs and of course you have to use the sentiment to tie it all together! Just a simple card for two people with simple pleasures we enjoy together! :) The card was completed with some yummy Love Me Some Latte gumdrops. Be sure to play along for a chance to win some fabulous prizes by some of the fabulous sponsors lined up just by linking your newly made card or project! Thanks for stopping by and hope you have a great Monday!! It's another Friday Challenge project with Your Next Stamp and I couldn't resist inking up the newest set of Waddles Trick or Treat. This is such an adorable set for the holiday and would make for some cute projects to use it for. I also dabbled in some watercolors, using both some distress inks as well as some watercolors from ShinHan over some watercolor paper for the background before popping up the image over it. The image was colored with Copics and cut out using the coordinating die while the sentiment was stamped directly on to the patterned paper. The paper is Doodlebug and Co. I paper pierced around the edges of the main panel and finished the card with some ribbon, a button, and some white twine for an added element. To complete the look I had to use some of the new yummy Gumdrops called Spellbound for a fun touch. Well, that sums it up for me today. Be sure to stop at the YNS Blog to see all the fun DT creations for today! Thanks so much for stopping by and hope you have a great Friday! It's feature day with Your Next Stamp and you're about to get schooled! :) Not really, but it is all about school and how cool it is. The DT members have a great line up for you to check out and see all their fabulous school creations. For my creation, I have made a bookmark using the Bookmark/Tag die set and the ever cute set of A'dork'able to go along with a reading log the kids love to fill out. The image was stamped and colored in with Copic markers before being fussy cut out to be place on the bookmark. The bookmark was cut out with the YNS Bookmark/tag die set using some patterned paper from EP. I stamped the sentiment directly onto the paper before adding a large eyelet to the top and some ribbon. I didn't want the bookmark to be bulky so I was sure to not pop up the image as much as I wanted to. 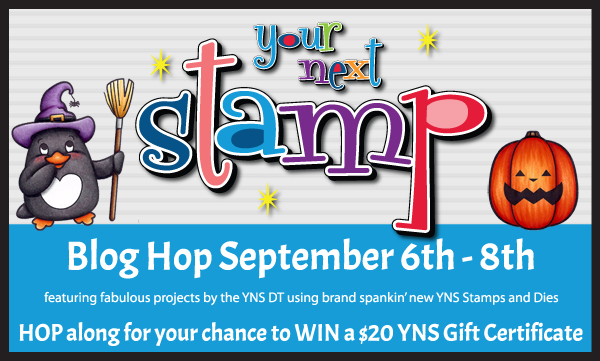 Head over to the YNS Blog to leave a little love and have a chance at winning a stamp set of your choice!! Thanks so much for stopping by! I made it through the first week of school and my boys enjoyed it even more which makes it even better. With this first week of school, I already needed a friend to help me out. 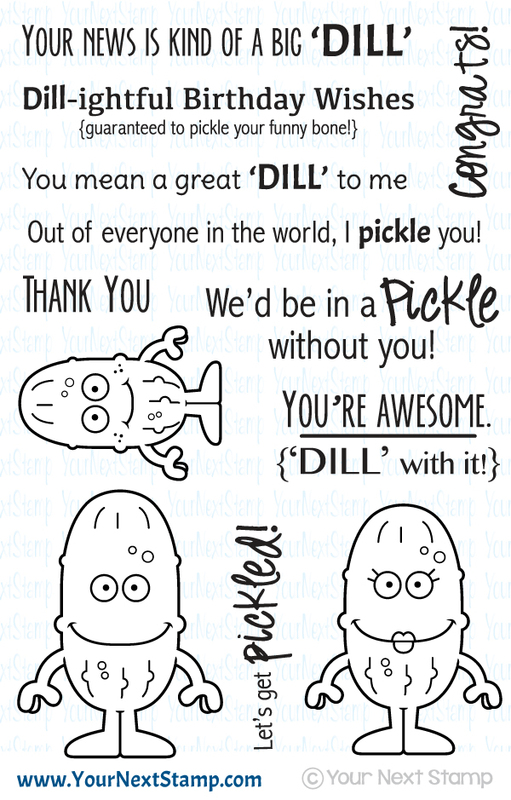 Using this new, fun set from Your Next Stamp called Dill-ightful, I figured it was a perfect set to make a thank you card for my friend with the family of pickles (depicting mine..lol) on the front. I used the current sketch on the YNS Challenge blog and adding some faux stitching along the edge of the mats. 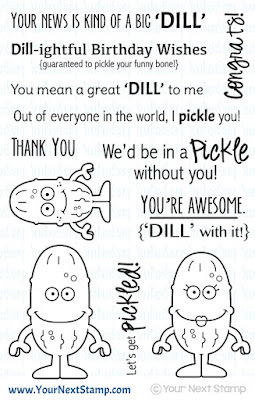 The coordinating die set was used to cut out the pickles while the sentiment was stamped on both the patterned paper from Crate Paper and on the strip on the bottom. Foam tape was used to pop up the "kids" and sentiment. I hope you all had a great week but be sure to stop by the YNS Blog to see the other DT creations! Thanks for stopping by here and make it a great day! This month's release has plenty of new and fun images to get your creative mojo flowing to make something so fun and unique! For my project, I decided to use the new coffee set of Perk Up to create a small canvas "painting" using my Copic markers and Distress Inks to color my image. The canvas is a 4x5 and used Memento ink to stamp the image before coloring it in with Copics. I did heat set the coloring in between colors and when it was complete. The sentiment and coffee mug were stamped below the image and I gave the mug a pop of color to the subtle colors of the coffee maker. I then used my distress inks in Antique Linen and Tea Dye to be sponged along the edge and toward the image to take down the white brightness. To complete the look I doodled along the edge which after I did it, I realize that I am terrible at it! LOL..
Be sure to stop by the YNS Blog to see all the the DT projects and don't forget to leave a little love while you are there so that you can have a chance at winning stamp set of your choice!! Thanks so much for stopping by and hope you have a great Wednesday! How about that?! The month of August came and went just like that and now it's September! But that only means it's release time and blog hop with Your Next Stamp and THAT just makes a new month better. Well, in my case it's this and back to school in just a few days! Whoo hoo!! It has been a very busy Summer for me and my family that I am ready for schedules and consistency. But enough of that... Let talk about this fabulous release. There is so much Halloween goodness along with some fun, funny sets that all of it is sure to make your wish list. For my first project I am sharing with you is an unconventional back to school goody for my son who happens to love snack pickles. I made a tag using the new set called Dill-ightful and the coordinating die set. How fun is this set? Pickles make such cute characters and this set doesn't disappoint. I created this tag starting with the Bookmark/tag die set and the scallop circle set paired with some patterned paper from Crate Paper. The image was colored in with Copics and cut out to be popped up over the scallop circle. The sentiment was stamped off center at the top and the tag was finished with some ribbon. 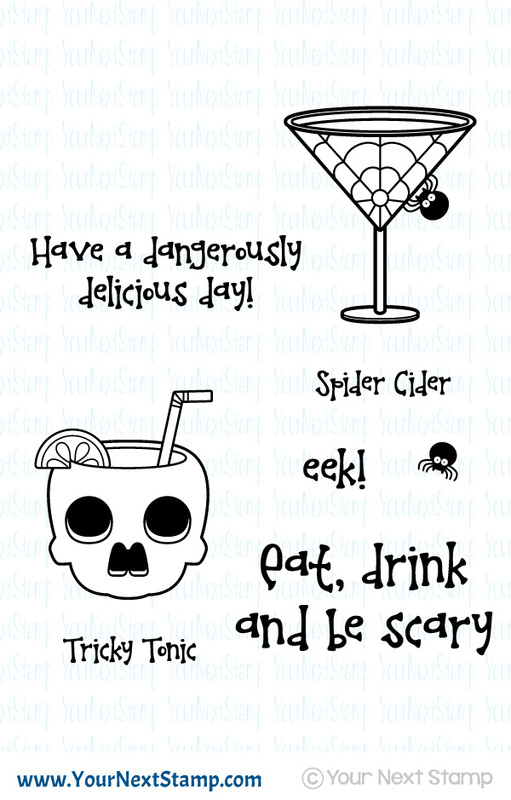 For my second project, I made a card using the new fun set called Tricky Tonic and used the coordinating die set. Also used is the new fun drippy goo die. So perfect for Halloween. Now I have start by saying that the bottom scallop is truly a deep purple color, but no matter how this picture was finagled, it still looks blue. :) For this card, I used some patterned paper from Doodlebug & Co for the top scallop cut out with a die, while the image was colored in with Copics to look like a candy corn drink and cut out with the coordinating die to be popped up. I added the drippy goo die under the bottom wonky scallop strip and some white stitching was added to the edge of the scallops. 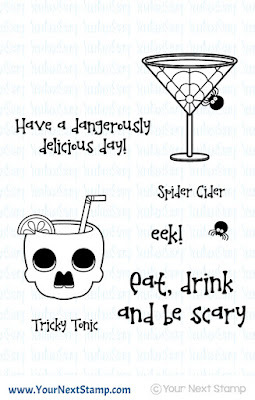 The cute little spiders were stamped and cut out with the die and popped up for dimension. I stamped the sentiment directly onto the card base and doodled the web from the spider. 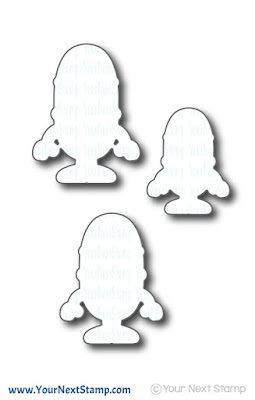 It's preview day with Your Next Stamp's September release to share with you all! This release is sure to meet your Halloween, coffee loving, and cuteness needs. Karen has done it again with this release and every month just get's better. I am loving this one for sure. I definitely do not have enough Halloween sets, so you can imagine my excitement when I saw all the fun sets. 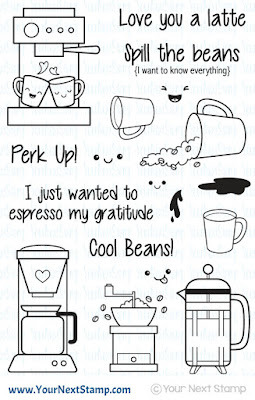 For my card, I am using a new set called Perk Up. 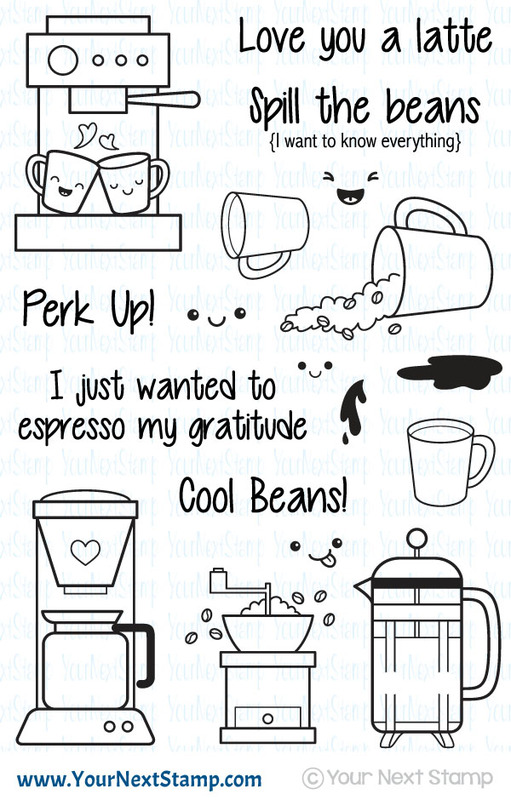 I am quite partial to coffee sets and this one is so super cute and fun - perfect for all you coffee lovers! The layout of this card was inspired by Jen Shultz and thought it was a perfect fit for this set. Using my distress inks, I sponged in a circle and spritzing it with some water for some subtle water drops. The image was colored in with Copics and cut out to be popped up over the sentiment banner and sponged circle. Using some linen cloth tape, I used that for my bottom strip before layering it with the sentiment. Be sure to stop by the YNS Blog to see the other fun creations by the team and make your list for tomorrow's release! 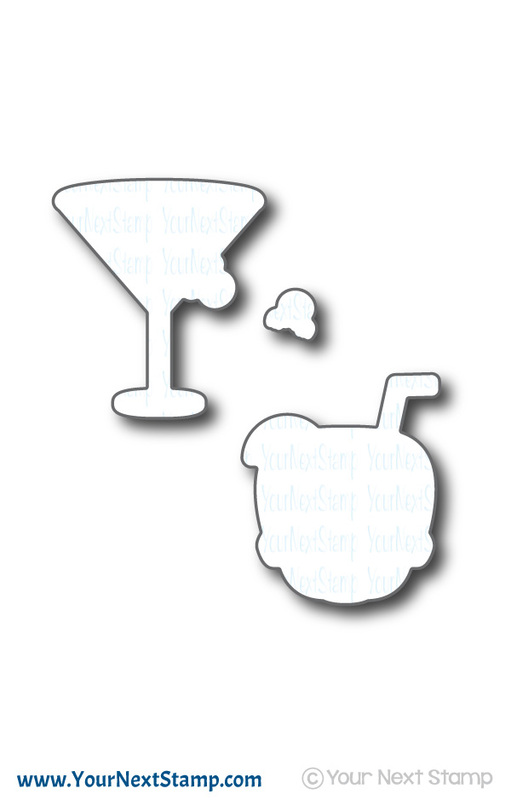 ;) Thanks for stopping by and taking a sneaky peek!